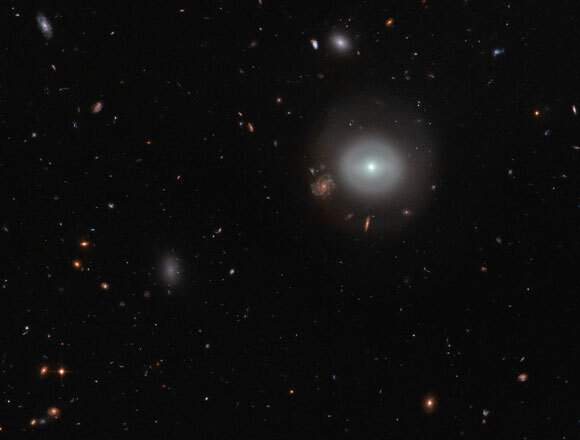 This newly released Hubble image shows lenticular galaxy PGC 83677, which is located 300 million light-years away. A lone source shines out brightly from the dark expanse of deep space, glowing softly against a picturesque backdrop of distant stars and colorful galaxies. Captured by the NASA/ESA Hubble Space Telescope’s Advanced Camera for Surveys (ACS), this scene shows PGC 83677, a lenticular galaxy — a galaxy type that sits between the more familiar elliptical and spiral varieties in the Hubble sequence. This image was obtained as part of the Coma Cluster Survey. It reveals both the relatively calm outskirts and intriguing core of PGC 83677. Here, studies have uncovered signs of a monstrous black hole that is spewing out high-energy X-rays and ultraviolet light. Be the first to comment on "Hubble Image of the Week – Lenticular Galaxy PGC 83677"